The Libretto is based on Tagore’s narrative poem Debatar Gras. This work, written at the request of Hans Werner Henze, is the first part of the Double Bill which includes its companion work Broken Strings. Dawn. As the boat hired to carry Maitra and his group of pilgrims is being loaded, Moksada appears, begging Maitra to let her join the pilgrimage. His concern is for Moksada’s son Rakhal; but when Moksada says that Rakhal will stay with her elder sister Annada, Maitra agrees to let her join them. While she is away collecting her baggage, Rakhal is discovered hiding on the boat: he too wants to join the pilgrimage. Moksada, returning, is horrified to find her son there. Although the Boatman claims the boat is overloaded, Rakhal’s eagerness persuades Maitra to let him stay. Moksada, furious, curses her son, but immediately realises what she has done, seeks forgiveness and clasps her son to her. Annada rushes in, appalled at losing Rakhal, and fearful for his safety on the journey. As the wind rises, the Boatman casts off. An orchestral interlude evokes the voyage and the festival. The pilgrims wait for the tide to turn so they can return home. Rakhal is now restless and homesick, while Moksada’s anxiety about her curse remains, despite the festival. The tide swiftly rises and the boat sets out. At first, Maitra and the Pilgrims are exhilarated by the strong wind and current, but Rakhal is frightened, clinging to his mother. The wind turns to a storm: the Pilgrims call on the Boatman to head for the shore, but the boat is now out of control. The gods are angry, claims the Boatman, at having been cheated of their due: the Pilgrims throw their belongings overboard, but to no avail. Maitra now points to Moksada as the one to blame, and in their panic and fear the other passengers urge that Rakhal be sacrificed to save the rest. Moksada desperately tries to protect him, without success: Rakhal is thrown into the water. The boy’s drowning screams awaken Maitra’s conscience. As the sun sets and darkness falls, Maitra leaps into the sea. Param Vir’s two operas, Snatched by the Gods and Broken Strings, were commissioned by the Munich Biennale (like Mark-Anthony Turnage’s Greek) and first performed in Amsterdam in 1992. They received their UK premieres at the Almeida four years later. Scottish Opera has now shown remarkable vision in staging new productions of them and has been rewarded by a spectacular evening of music-theatre. Vir writes as brilliantly for voices as for instruments. While the two scores show that he admires Berg (the drowning from Wozzeck), Britten (Tadzio from Death in Venice) and Messiaen (ornithological instrumentation passim), these signal where he comes from: his healthy sense of his own musical identity is unthreatened by references to his peers. 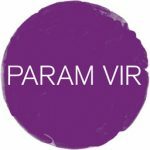 Param Vir’s two one-act operas were commissioned by and premiered at the Munich Biennale in 1992, where they won him the Best Composer prize. The same year they were also given in Amsterdam, whence Michael Davidson reported with enthusiasm on both the works and Pierre Audi’s productions (OPERA, September 1992, p. 1097). Well, four years later and better late than never, they have at last received their first British performances and added lustre to one of Almeida Opera’s best seasons yet. Vir (born in Delhi in 1992) has been nurtured and encouraged by Maxwell Davies and Knussen and, as that would suggest, his musical language is neither confrontationally modernist nor neo-conservative: he knows his Britten and his Berg, he knows what works in the theatre. He also knows which instruments cover voices at what pitch and which don’t: one of the great pleasure of this double bill was being able to hear every word over luscious, exotically coloured instrumentation in a notoriously tricky acoustic – an acoustic tamed by Markus Stenz’s brilliant direction of the (by Almeida standards) massed bands of the London Sinfonietta ranged round the curved back wall with two banks of percussion in the circle. Snatched by the Gods is to a libretto by William Radice based on a poem by Rabindranath Tagore. A boat carrying pilgrims to a Hindu festival is hit by a sudden storm; a child who joined the expedition is thought to have been cursed by his widowed mother and is sacrificed to the greater good. This chilling piece – a weird mixture of Curlew River and Der Jasager – is expertly laid out and paced over just 50 minutes. Strangely, the mother is denied the last word, but Susan Roberts suggested her instability cogently, and Ben De’Ath gave a touching performance as her initially cheerful, ultimately bemused child. Robert Poulton and Fiona Kimm gave powerful support. William Radice’s text for Snatched by the Gods is adapted from Tagore, describing a band of pilgrims on their way by boat to a Hindu bathing festival at the mouth of the Ganges. Moksada’s neglected young son Rakhal wants to go too, and tries to stow away. His mother lets him come along with the words: “All right! The sea can have you.” On the way back, the pilgrims and boatman, caught in a dangerous storm, remember Moksada’s phrase and conclude the gods are keeping her to her word. Maitra, in charge of the trip, tries to save the boy, who has been cast into the water, by jumping in himself; but he also drowns. Audi used a hanging platform that sways about the stage, shiplike, only to isolate the boy Rakhal and his mother. A few naturalistic snapshots of sunset and sunrise created with warm low-angled lighting from the side added an atmosphere of dubious hope. 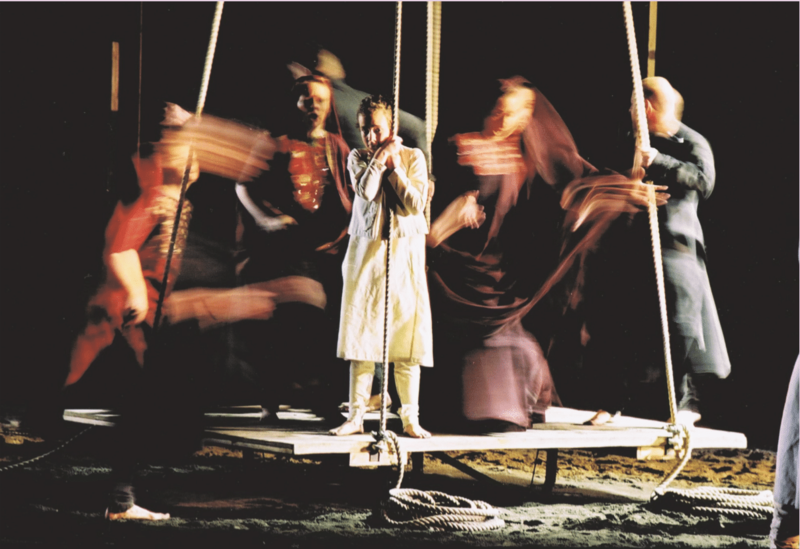 The burden of the drama was placed on the acting of the principal performers: Michael Lewis as Maitra, Cynthia Buchan as Rakhal’s aunt Annada, and Katherine Ciesinski as Moksada, whose passionately glowing performance was the pivot of the whole interpretation. Audi’s ritualistic approach made the work rather reminiscent of Britten’s church parables, but the music is far dirtier and more energetic. This was a more conventional opera than Broken Strings — almost Puccini-style verismo in dramatic approach. Intense, sombre and popular.